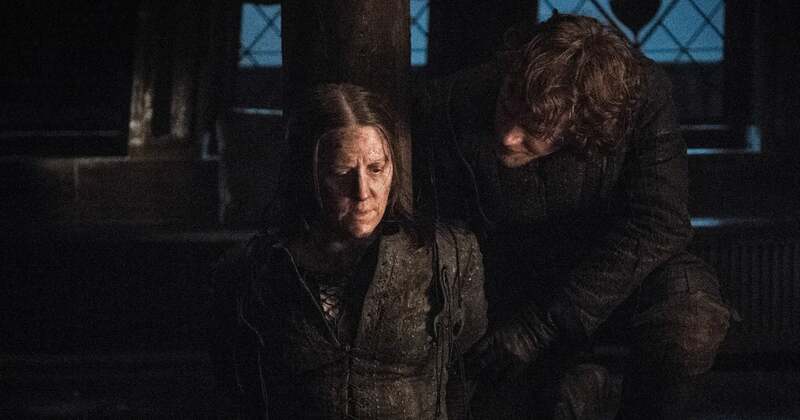 In the premiere, we see Theon and his crew invade the ship where Yara is being held captive and rescue her, but it's partially his fault that she was there in the first place. Back in season seven, the Greyjoy siblings were headed to Dorne with Ellaria Sand when they were overtaken by their uncle Euron. Upon seeing his soldiers being tortured by Euron's men, Theon's old despondent, cowardly self resurfaces and he jumps overboard, leaving his sister behind. Theon's cowardice finally turns around again when he's forced to face off against Harrag, one of the last remaining captains loyal to Yara. However, he's able to defeat her when she relies on attempting to kick him in the groin (it doesn't have the desired effect, since he was long ago castrated by the sadistic Ramsey Bolton), and he earns the respect of the remaining loyalists, rallying them to his mission . While we can definitely appreciate Yara's mildly violent reaction to seeing her wishy-washy brother again, we have a feeling that both Greyjoy siblings might be pivotal to helping turn the tide for the new Stark/Targaryen alliance in this final set of episodes.